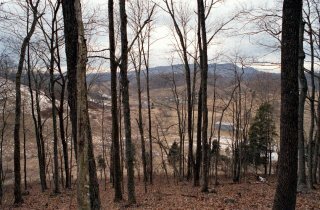 14-Jan-2001 -- I took advantage of a long-planned weekend in Roanoke to attempt the western-most confluence in Virginia. For those who may not be aware of some of the trivial facts about Virginia, it stretches out quite a bit farther west than most people realize, and this longitude is actually west of both Cleveland, Ohio, and Charleston, West Virginia. Starting in the morning from Christiansburg, Street Atlas sent us down Interstate 81 almost to Abingdon, then north along Route 80, which crossed Clinch Mountain. I could see that this road would be curvy, but I had no idea just how curvy! I spent a good deal of my childhood on mountain roads in Virginia and West Virginia, but this was a new experience. Signs prohibited trucks longer than 35 feet from using this road. Even that would have been a stretch! After deep icy valleys where "the sun don't shine," dozens of hairpin turns, and some incredible snow covered mountain scenery, we emerged on the other side in the small town of Honaker, Virginia. Here we switched over to the topo map printout obtained from the link on the Confluence Project web site, and proceeded through the town to Route 645. From the topo map, I had suspected that this confluence was located in someone's "back yard" as there was a building shown along the road directly in line to the confluence. We drove by to assess the area. It is actually quite a bit more populated than the topo map shows, with a couple dozen houses spread along Routes 645 and 651 in the general area. The one building between the road and the confluence was an abandoned farm house, and my hunch was correct: the path to the confluence was through the "back 40" behind this farm house, complete with a herd of cows to keep guard! The good news was there weren't any "No Trespassing" signs. The bad news was that even though there weren't any signs, there was a locked gate, and I wasn't really enthusiastic about risking a confrontation with some mean-spirited bull that might be wandering around the cow pasture! On the second try, we found someone at home. A grandfatherly type gentleman named "Mr. Musick" who lives just down Route 651 to the north of the confluence. He was outside, dumping ashes from his coal stove in the garden. I chatted with him for several minutes, opting for the "scavenger hunt" analogy. He told me about the owners, local boys, who were very nice people. They also owned a local funeral home. He thought certainly they would have no objections to us taking a short walk on the land. And he also assured me that there were no dangerous cattle among the herd. The topo map shows the confluence to be about half way up the rather steep hill at the back of the pasture. In fact, my short talk with Mr. Musick was very enlightening, as he provided the name "Tom's Stump Knob" for the location of the confluence. This name somehow didn't make it on any of the maps I had, and unfortunately, Mr. Musick didn't know who Tom was or how he may have lost a limb. We covered the flat open part rather quickly, but then found the knob to be quite a bit steeper than it looked! As with prior confluence hunts, the final few feet are the hardest, as you circle around, waiting for the readings to settle out to all zeros. I can say that when searching on the side of a steep hill, this can be rather irritating to discover you have climbed higher than you had to! We finally found the spot, [Picture 4] and set about to take pictures. Here are Megan and myself standing on the confluence with the view to the east [Picture 5]. Another interesting discovery made on this trip was that when you are taking a picture of yourself from 12 feet away, on the side of a steep hill with slippery leaves and dead trees all over the ground, a ten second delay on the camera self-timer is barely enough time to get yourself into the picture, and in fact, it may turn out looking like you are about to fall over! And rest assured, this was indeed the case. That done, I snapped a lovely view to the north [Picture 1] with Mr. Musick's house just barely visible in the very center of the picture, and a last view to the west [Picture 6]. I would have taken a picture to the south, but trust me, it was a rather boring, close-up view of leaves on the side of the hill. So we packed up the gear, and sneaked out among the cattle and their pies, and made our way back to civilization. Another confluence under the belt! #1: A confluence with a view (to the north). #2: View of the confluence from about 400 yards away. #3: Some cows coming to see what we were up to! #4: The Garmin 12XL shows us right on the spot. #5: Megan and Theron on the confluence. View to the east. #6: View to the west.